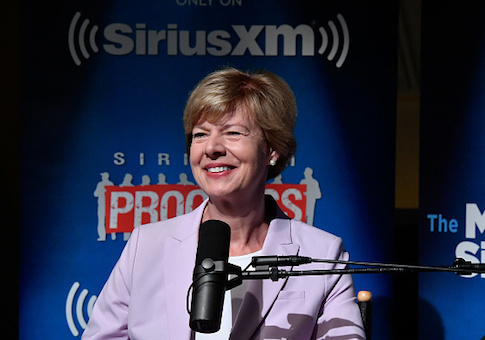 Sixty percent of Sen. Tammy Baldwin's (D., Wis.) campaign contributions have come from individuals who live outside of Wisconsin, filings show. Baldwin's campaign, which reports more than $20 million in total receipts, has hauled in contributions from nearly 7,800 Californians totaling $1,753,366 while 1,400 New Yorkers have added $1,420,487 to her coffers this cycle. People in Illinois have given $630,000 while $570,000 more came from backers in Massachusetts. Individuals who live in Washington, D.C., Texas, Pennsylvania, Florida, and Maryland added a combined $1.8 million to Baldwin's campaign, records show. Baldwin taking in 60 percent of her itemized campaign contributions from out-of-state donors is a slight increase from earlier this year when around 57 percent of Baldwin's money came from outside of Wisconsin. Republican Leah Vukmir, a registered nurse and Baldwin's opponent, has raised more money in state: Nearly 70 percent of Vukmir's campaign contributions are from Wisconsinites, filings show. The battle for Baldwin's seat has already seen millions in outside spending going into the state, which Baldwin regularly uses to raise cash for her campaign. However, Baldwin also receives millions in backing from outside groups despite chastising the money from Republican groups and donors. Baldwin has also taken in hundreds of thousands in bundled contributions from D.C lobbyists. The Senate Majority PAC, a D.C.-based PAC launched by former staffers of retired Sen. Harry Reid, has poured millions into the state to back the Democratic senator. The Senate Majority PAC reports nearly $80 million in donations this election cycle and its top donors include Donald Sussman, a hedge funder who has given $3.5 million to the PAC, and Alexander Soros, the son of liberal billionaire George Soros, who has given $2 million. George Soros has added $1 million to the PAC. The Senate Majority PAC has shared staff and office space with Majority Forward, a liberal group that has run ads this cycle defending Baldwin over her handling of the Tomah VA scandal in Wisconsin. Baldwin was the only member of Congress from Wisconsin who received an inspector general report in 2015 detailing abuses at the Tomah VA facility and did not act until months later after a Marine had died from an overdose at the facility. Majority Forward ran the ads defending Baldwin alongside VoteVets, a progressive veterans group that has received millions from the Senate Majority PAC. Majority Forward was incorporated by Marc Elias, a partner at the D.C. office of the Perkins Coie law firm, who is considered the "go-to fixer" when Democrats are in trouble. Elias was brought in by Baldwin as he was gearing up to act as Hillary Clinton's top campaign lawyer and was paid $90,000 for crisis control that year. Baldwin quietly left the committee with oversight of the Tomah VA in early 2017. Baldwin's campaign did not respond to requests for comment on her campaign contributions.